It is no secret that not only are some of the world’s most talented people from the harshest corners of the world, but they are also some of the most determined, artistic, relentless and fierce in the pursuit of happiness, fortune and fame. All adjectives that perfectly describe brothers Gary, Lionel, Chris and their cousin Damian better known to their fans and entertainment community as “Active Dancers”. The brothers born and raised in ST. Mary, and cousin Damian in Portland, Jamaica, dancing came as naturally as walking to each of them, and through the years the young men made a name for themselves with their eclectic fashion sense, inventive, energetic and original dance moves. Recognizing the feeling of happiness that music and dancing brought to people, they decided in 2002 to take their message to the world, needing first to conquer their own beloved island of Jamaica. Active Dancers recognized that the world took it’s cue from Jamaica’s famous street dances such as “Pass Passa”, “Weddy Weddy” and “Uptown Mondays” to name a few, there such legendary dancers as Bogle and John Hype displayed their talents and latest dances to fans, partygoers, peers and the rest of the world who watched through the video lenses, and internet videos. The group invested their all into chasing the camera. Their talent and determination paid off when they caught they eye of David “Squeeze” Annakie CEO of LinkUp Media Group who extended an invitation for Active Dancers to perform at an event in New York and their lives forever changed when at their visa appointment their were asked to dance and perform right then and there for the issuing officers! Making the move to America wasn’t without struggles but Active Dancers went hard on their promotional trail which paid off into major stage presence and high profile videos such as Shaggy & Barrington Levy “Broadway”, Sean Paul “Sky”, Shaggy & Bruck Up “Sunglasses at Night”, Busta Rhymes & Nicki Minaj “Twerk” and more recently Mavado & LL Cool J “Hustler”. 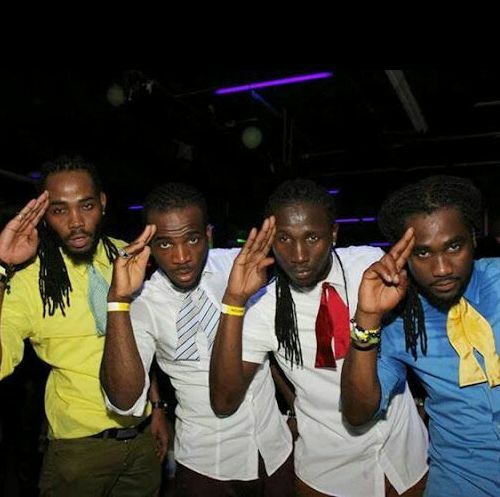 Their latest project brought more than one blessing as Active Dancers were acknowledge and recognized by billboard chart topping Mavado when they were introduce at a show in Connecticut by their manager, a long time friend of the international artist. When opportunity knocks you answer, and Mavado gave them a chance to be the opening act and was so impressed and supportive that they became his opening act for the rest of his tri-state tour. In a statement to the media, the talented foursome stated, “We were so happy and excited to open for his crowd, it was such an honor. We want to give a special thanks to Mavado’s manager Junior, and although we have privately thanked Mavado, we would like to publicly acknowledge and thank him for all that he has done for us, for the opportunities, his support to not only us as a group, but to dancehall as a whole”. As their slogan eloquently states”Crazy we no Lazy”, Active Dancers aims to brand themselves with everything from their obvious dancing talents, to promoting their lifestyle from fashion to health. Their manager recently announced an unprecedented “Ziplock” event which they will hold monthly and bring out worldwide dancehall talents to entertain the crowd and cross promote dancehall “From Japan to Africa we will invite them”. The event will take place in New York, further information will be made available on their facebook fan page www.facebook.com/theactivedancers. The group is also gearing up for several promotional tour in New York, Florida, Jamaica and aiming for Europe and Asia in 2015.